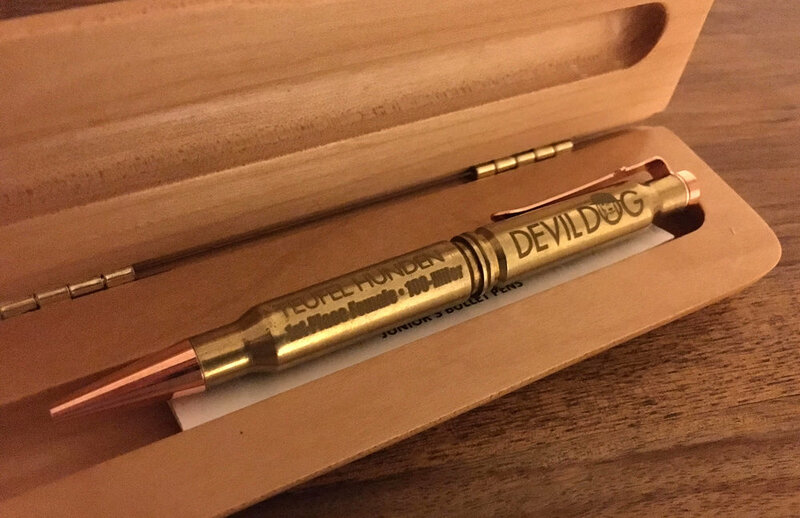 It's November 10, which means Happy birthday to the original Devil Dogs, the men and women of the United States Marine Corps! It's also the day we promised you a race swag SitRep, and here at DD HQ we always deliver -- especially when our fabulous RD gives us a firm deadline. So ... here you go, runners! All registered runners will receive a Devil Dog Ultras Headsweats hat. Runners will also get a fantastic long-sleeve hoodie t-shirt we're still working on ... because, you know, deadlines. 100-mile finishers will get a shiny new buckle (modeled here by Toofy) and 100K finishers run away with a Bottle Breacher (displayed by Gunny). Bottle Breachers are bottle openers handmade by active duty service members and veterans using .50-caliber rounds. We love both of these and think you will too. Still not registered? There are still spots left in both distances, but sign up soon! Registration will close December 14. Not ready to run, but still want to come party? Join our volunteer list here.